It’s not real common that when a professional athlete gets hurt that they rely on the benevolence of the community to help them out, but that’s exactly what Denver Nuggets fans are doing for summer league member Josh Adams, who suffered a fractured vertebra in a traumatic car accident. “After speaking with the emergency responders, and the neurosurgeon, we were informed how lucky we are to still have Josh with us today. As you can imagine, medical costs for this type of injury are substantial, so through the advice and support of dear friends we are utilizing gofundme to reach out to friends, fans, and supporters of Josh to help raise funds to offset the medical costs,” Adams’ go fund me page reads. Details and news reports are very scant on the car accident, but Adams was involved in a car accident in the Denver-Metro area last season, according to a statement put out by the University of Wyoming. From all news accounts this Littleton car accident lawyer reviewed, it appears Adams was involved in a single-car accident. No one else was injured and no drugs or alcohol are suspected in the crash. Adams had recently signed with Avtodor Saratov of the Russian VTB United League, who hopes Adams is able to make the second half of the season after recovering. The accident fractured Adams’ C5 and C6 vertebrae. The former University of Wyoming standout was recovering at his parent’s home in Castle Rock, CO after being involved in the near fatal car accident. 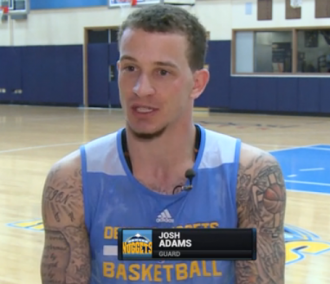 Adams attended Chaparral High School in Parker, CO, where he helped the Wolverines win a 5A State Championship in 2012. He earned the Mountain West Championship MVP award after helping the Cowboys win that tournament. Did Josh Adams Let Distracted Driving Get the Best of Him? Well, did Josh Adams’ let distracted driving get the better of him? We may never know, because the press is being pretty tight lipped about the cause of the accident. But, the odds are pretty good that his accident was caused by some prohibitive factor. According to the National Highway Traffic Safety Administration, this is “any activity that could divert a person’s attention away from the primary task of driving.” Certainly, all distraction impacts our driving, but it’s important to be aware of them and stay focused on our driving first and foremost. In 2014, there were 3,179 deaths and 431,000 injuries involved in distracted driving motor vehicle accidents. As of December 2014, there have been 169.3 billion text messages sent in the U.S. every month. 10 percent of all drivers ages 15 to 19 years old involved in fatal car accidents were reported as the result of distracted driving. The number of drivers text messaging or manually manipulating smartphones increased from 1.7 percent in 2013 to 2.2 percent in 2014. If you have been injured by a driver who was reported to have been distracted driving, then it’s time to contact a knowledgeable and trusted Littleton Car Accident Lawyer at Bahr, Kreidle & Flicker. Since 1983, our car accident lawyer has been fighting on behalf of injured people who seek justice and compensation for damages. Our car accident lawyer knows how serious and devastating the impacts of an injury sustained from a motor vehicle accident can be, and we know that many injured people depend on settlements to get their medical bills paid and the treatment they deserve. That’s why we are committed and aggressive when it comes to advocating our client’s rights while working diligently to help them maximize their financial recoveries. To set up an initial, free consultation to learn more about how we can help your case, call us at (303) 794-7422 or email us using the contact form on this page. 1“Former Cowboy Josh Adams injured in car accident” published in the Gillette News Record, August 2016.